What is a Lumon Glass Balcony Façade? A Lumon glass balcony façade combines modern aluminum railings with tempered or heat-soaked frameless retractable glass panes that go above the railings, creating an elegant glass balcony façade system. They can be customized to fit existing building structures. It provides a strong and effective windbreak as well as protecting against birds. As a result, balcony lifespan is extended by up to 25 years and concrete deterioration is reduced by up to 100%. In addition, our glass balcony façade improves the appearance of buildings, for greater curb appeal. Unlike a fixed glass balcony façade, Lumon façades can be opened or closed depending on the weather. Because of this feature, they don’t create an enclosure and don’t count toward gross floor area. Our railing to roof Lumon façades are designed to work with existing balcony rails or with the Lumon balcony railings. To install, aluminum profiles are mounted onto the ceiling and the top of the balcony railing. Then, tempered glass panes measuring six, eight, 10 or 12mm thick are fastened to the profiles to create an open feeling with excellent sight lines. Our floor to roof balcony glass sits inside the balcony railing. Aluminum profiles are mounted into the floor and the ceiling. Tempered glass panes measuring eight, 10 or 12mm thick are fastened to the profiles. Again, these façades allow for excellent sight lines and a minimalist feel. Lumon façades are CCMC approved and meet zoning requirements for condo balconies. Our experienced team will work closely with strata councils, condo boards, and any other interested parties to obtain all the necessary permits and documents. Our façades have been approved, installed and tested in hundreds of thousands of buildings around the world. Lumon façades have been shown to increase condo and building resale value and overall building value. Our technical consultants will work closely with you to ensure that our glass balcony façades will fit your building's needs. We also offer design tools and technical documents to assist you. 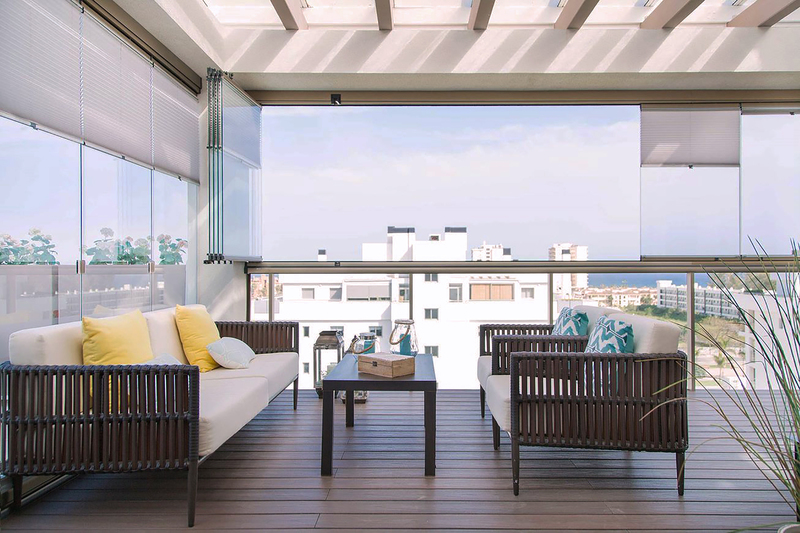 I certainly see the Lumon balcony glass system as an attractive option for owners or strata corporations looking for a way to improve energy conservation or to simply maximize the use of outdoor balcony space all year round. Why choose balcony glass for your building renovation? Balcony glass is the modern choice that many homeowners gravitate towards to improve the overall living space bringing many benefits with added space, functionality, quality and design. A cozy atmosphere is best complemented with the outdoors and what better way than to enjoy from the comfort of the home. Visit our project gallery for more! Renovating your building to expand and beautify the outdoors for residents and homeowners is an exciting and profitable venture. Browse our project gallery to gather ideas and inspirations for our custom balcony enclosures that will improve the quality and value of homes.